A third Cincinnati team of the same name was founded in 1881, becoming a founding member of the American Association, a rival league that began play in 1882. That team which is the same franchise of today played for nine seasons in the American Association and won the Association pennant in 1882. The pennant winning club still holds the record for the highest winning percentage of any Reds club to date (.688). In November 1889, the Cincinnati Red Stockings and the Brooklyn Dodgers both left the Association for the National League. In the move, the Red Stockings dropped “Stockings” from their name. A new Cincinnati Red Stockings team became a charter member of the National League in 1876, five years after the first Red Stockings team. 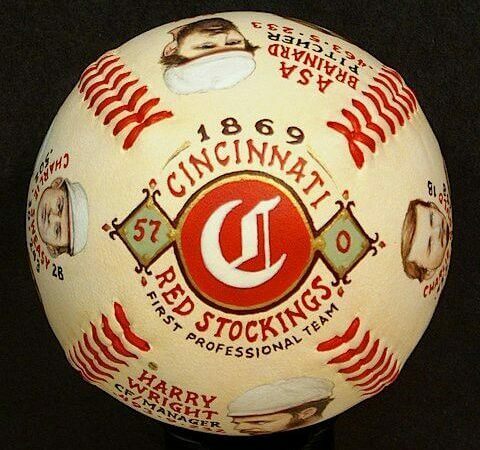 Red Stockings – The first openly all-professional team was the famous Cincinnati Red Stockings of 1869 – 1870. 1998 – 2006 / Carl Lindner, Jr.
1933 – 1961 / Powel Crosley, Jr.
Who is the greatest Cincinnati Red Stockings?